~3% Finns and Finnish is recognized as a minority language. d. ^ As of 2008, 18% of the population had foreign origins (13% if excluding Finns and 9% if also excluding other Scandinavians), with 14% foreign-born and another 4% born in Sweden of two foreign-born parents. f. ^ The .eu domain is also used, as it is shared with other European Union member states. The .nu domain is another commonly used top-level domain ("nu" means "now" in Swedish). Sweden (Sverige in Swedish) is a Nordic country in the part of Europe called Scandinavia. Its neighbors are Finland and Norway. Sweden is also connected to Denmark in the south by a bridge. It is a developed country. It is famous for its welfare state. People who live in Sweden are called Swedes. Sweden's capital city is Stockholm. Sweden is a constitutional monarchy because it has a king, Carl XVI Gustaf, but he does not have any real power. Sweden is a parliamentary state meaning that the government is elected by the parliament which is appointed by the people. The country is democratically ruled by a government headed by an elected prime minister. Stefan Löfven was elected Prime Minister in September 2014. He took office in October 2014. The population of Sweden is almost 9.5 million people. Sweden has an official majority language, (called svenska in Swedish). Sweden has five official minority languages, Finnish, Yiddish, Sami, Meänkieli and Romani. 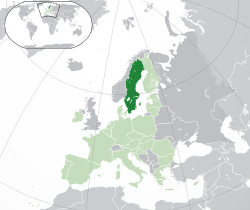 Sweden became a member of the European Union in 1995. It is not a member of the European Monetary Union. Sweden has not begun to use the euro as currency. This is because the people have voted against this. The currency remains the Swedish krona (Swedish crown). Sweden has 25 provinces (landskap). They are found in three different regions: Norrland in the North, Svealand, the central region, and Götaland in the South. Sweden has been a country for a thousand years. In the middle ages Sweden had the same king as Denmark and Norway. In the early 16th century Sweden got its own king, Gustav Vasa. During the 17th century Sweden was a great power. Sweden had taken Estonia, Latvia and Finland and parts of Norway, Germany and Russia. In the 18th century Sweden became weaker and lost these places. In the early 19th century Sweden's king died without an heir and the Swedish parliament voted for Jean Baptiste Bernadotte as the new king. Bernadotte fought Denmark and made them give Norway to Sweden. This was Sweden's last war and Sweden has not been at war for 200 years. In many wars, including the Vietnam War and World War II, the country was neutral, meaning it did not take sides. During World War II, it traded with both the British and the Germans in order to protect its neutrality. Sweden is divided into twenty-one counties. They are Stockholm, Uppsala, Södermanland, Östergötland, Jönköping, Kronoberg, Kalmar, Gotland, Blekinge, Skåne, Halland, Västra Götaland, Värmland, Örebro, Västmanland, Dalarna, Gävleborg, Västernorrland, Jämtland, Västerbotten and Norrbotten. Sweden has been christian for a thousand years. Sweden is traditionally a protestant country, but it is now one of the least religious countries in the world. 46-85% of all people in Sweden are agnostics or atheists. This means they do not believe in a god. About 6.4 million people in Sweden, that is 67% of all, are members of the Church of Sweden, but only 2% of members go to church often. In popular music, ABBA, Roxette, Entombed, At the gates, Dark Tranquillity, Hypocrisy, Grave, Dissection, Watain and Ace of Base have scored several hits throughout the years. Sweden is a country with many talents in sports, such as soccer player Zlatan Ibrahimović. Sweden has two bronze medals and one silver medal from the World Cup in football (soccer) - 1950, 1958 and 1994. The soccer league in Sweden is called Allsvenskan. Sweden has also performed well in ice hockey along with the USA, Canada, Finland, Russia, Slovakia and the Czech Republic. The men's ice hockey top division in Sweden is called SHL. Sweden has also had several successful table tennis players, including Stellan Bengtsson and Jan-Ove Waldner, as well as alpine skiers like Ingemar Stenmark, Pernilla Wiberg and Anja Pärson, as well as biathlete Magdalena Forsberg and tennis players Björn Borg, Mats Wilander and Stefan Edberg. Sweden also has great success in cross country skiing, javing won several medals in the Olympic games. ↑ "Befolkningsstatistik". www.scb.se. http://www.scb.se/Pages/Product____25785.aspx?produktkod=BE0101&displaypressrelease=true&pressreleaseid=257212. Retrieved 2009-06-16. ↑ "På lördag kan 440 000 flagga blått och vitt" (in Swedish). www.scb.se. 2008-12-05. http://www.scb.se/Pages/PressRelease____255905.aspx. Retrieved 2009-06-16. ↑ 3.0 3.1 Landes, David (2009-07-01). "Swedish becomes official 'main language'". The Local. thelocal.se. http://www.thelocal.se/20404/20090701/. Retrieved 2009-07-15. ↑ "Summary of Population Statistics 1960–2008". www.scb.se. http://www.scb.se/Pages/TableAndChart____26041.aspx. Retrieved 2010-06-03. ↑ 7.0 7.1 7.2 7.3 "Sweden". International Monetary Fund. http://www.imf.org/external/pubs/ft/weo/2012/01/weodata/weorept.aspx?pr.x=92&pr.y=3&sy=2009&ey=2012&scsm=1&ssd=1&sort=country&ds=.&br=1&c=144&s=NGDPD%2CNGDPDPC%2CPPPGDP%2CPPPPC%2CLP&grp=0&a=. Retrieved 2012-04-22. ↑ "Statistics Sweden". Statistics Sweden website. 31 May 2013. http://www.scb.se/Pages/Product____25799.aspx. Retrieved 27 July 2013. This page was last changed on 4 November 2014, at 18:13.